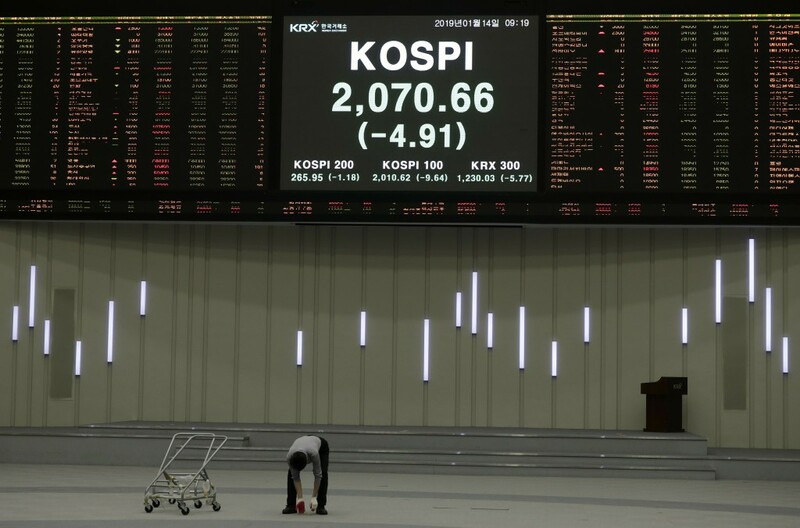 A man walks near the screen showing the Korea Composite Stock Price Index (KOSPI) at the Korea Exchange in Seoul, South Korea, Monday, Jan. 14, 2019. 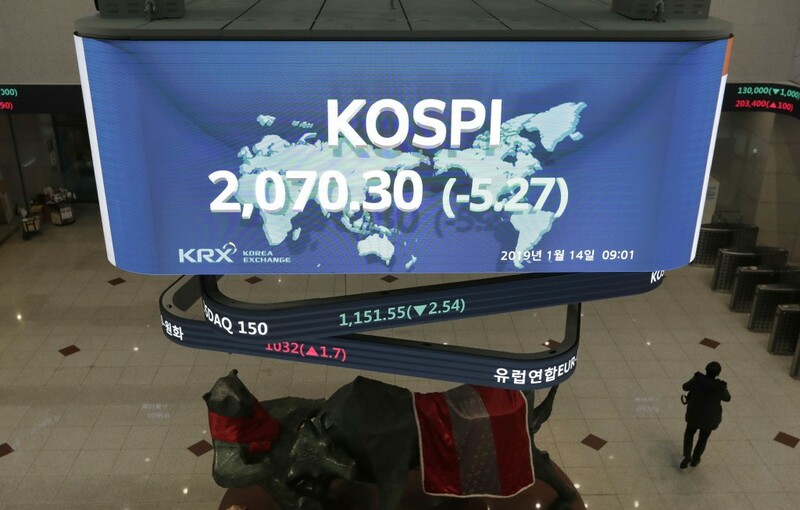 BANGKOK (AP) — Shares were lower in Asia on Monday, extending the latest losses on Wall Street, as China reported a slowdown in exports. KEEPING SCORE: Hong Kong's Hang Seng index lost 1.4 percent to 26,299.19 while the Shanghai Composite fell 0.6 percent to 2,539.59. 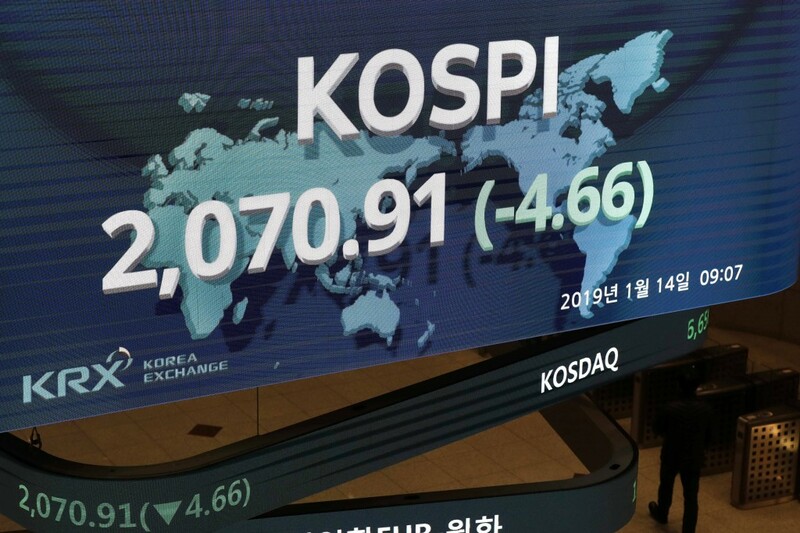 The Kospi in South Korea declined 0.7 percent to 2,061.25 and Australia's S&P ASX 200 gave up 0.3 percent to 5,757.50. India's Sensex dropped 0.6 percent to 35,801.95. 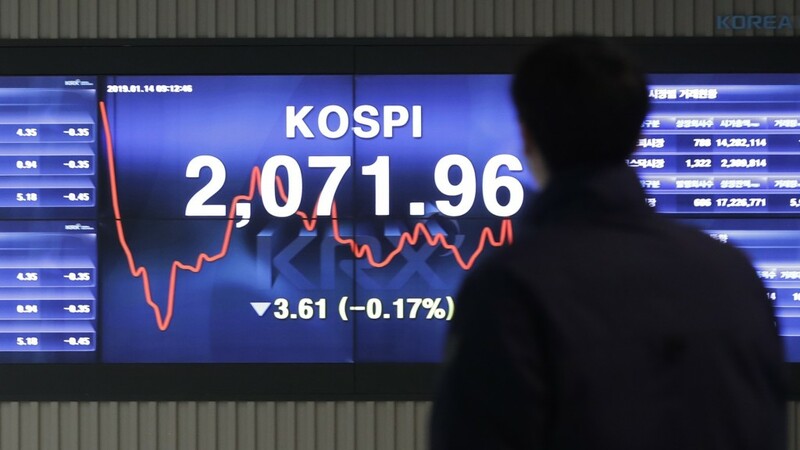 Shares also fell in Taiwan and Southeast Asia. Japan's markets were closed for a holiday. CHINA TRADE: China said Monday that its exports to the U.S. contracted in December although its overall trade surplus with the U.S. hit a record $323 billion in 2018. Exports to the U.S. rose 11.3 percent to $478.4 billion for the year despite punitive tariffs imposed by President Donald Trump in a fight over Chinese technology ambitions. The customs data showed imports of American goods rose just 0.7 percent over 2017, reflecting the impact of Beijing's retaliatory tariffs and encouragement to importers to buy more from non-U.S. suppliers. WALL STREET FRIDAY: U.S. stock indexes finished a hair lower on Friday after the falling price of oil weighed on energy companies. The S&P 500 nevertheless closed out its third straight winning week following a brutal stretch in December, edging 0.1 percent lower to 2,596.26. The Dow Jones Industrial Average dipped less than 0.1 percent to 23,995.95 and the Nasdaq composite lost 0.2 percent, to 6,971.48. The Russell 2000 index of smaller stocks ticked up 0.1 percent to 1,447.38. ANALYST'S VIEWPOINT: "Risk has continued to veer averse today as pre-earnings jitters amid a torrent of turbulent crosscurrents have investors adopting a more defensive approach even after the Fed indicated patience on further rate hikes," Stephen Innes of Oanda said in a commentary. ENERGY: Benchmark U.S. crude oil gave up 50 cents to $51.09 per barrel in electronic trading on the New York Mercantile Exchange. It lost 1.9 percent to settle at $51.59 per barrel on Friday. Brent crude, the international standard, lost 60 cents to $59.88. It sank 1.9 percent to $60.48 a barrel in London.